Water quality can influence the efficacy of chemicals used in spraying crops and pastures. This page provides information about how water quality affects herbicides and insecticides in a spray mix. result in spray line blockages. temperature – the rate of breakdown increases as temperature increases. Inactivation occurs when the herbicide binds (adsorbs) to contaminants – such as clay and silt – and reduces activity of the herbicide. Inactivation can also occur when mixing trace elements with some herbicides in the tank. When water quality is less than optimal, apply the spray as soon as possible; do not leave the mix standing in the spray tank. If in doubt, get your water tested. Read the label prior to mixing and applying any pesticide; the effect of variation in water quality on a pesticide will be outlined on the product label, usually in the section on tank mixing. Alkaline water may cause some chemicals to undergo hydrolysis. These pesticides should not be left in the tank overnight. Scheme water and/or water that has been stored in new concrete tanks may have a high pH. Measure your water pH – you can use a cheap pH meter or universal indicator strips – before spraying. Alkaline water often comes from limestone or marl formations, and acid water often comes from peaty soaks or swamps. Usually contains suspended clay or silt particles (colloids), which can absorb and bind some herbicides and reduce efficacy (especially glyphosate, paraquat and diquat). Cloudy water should be treated if paraquat or diquat are to be used. If glyphosate is being used, then treating the water is generally not recommended because the antagonism of the clays may be less than that of the clearing agents. Colloids can be removed by treatment with lime or alum, which flocculates (settles out) the particles, so they sink to the bottom of the tank or dam. This may leave free calcium or aluminium in the water that can react with certain chemicals such as glyphosate. Do not use alum treated water with glyphosate or atrazine-plus-oil tank mixes. Dirt blocks nozzles, lines and filters and reduces spray equipment performance and life. Settling of muddy or cloudy water should be done in the main supply tank. If absolutely necessary, it can be done in the spray nurse tank, but not the actual boom tank. As a rule of thumb: action needs to be taken if it is difficult to see a coin in a 9L bucket of water. High water temperatures can accelerate the process of hydrolysis, and cold water can result in gelling problems. Dispersing products formulated as wettable granules or powders may be more difficult in cold water. Ensure you agitate the mix thoroughly to reduce problems. This is caused by the presence of calcium and magnesium bicarbonates, sulphates, chlorides and nitrates. These ions can interfere with chemicals by the process of inactivation, breakdown or precipitation. Very hard water (greater than 1000ppm) can also affect surfactants and oils, and will change their properties of wetting, emulsification and dispersion. Hard water will not lather with soap, but will lather with shampoo. Concentrations of Calcium ions of over 50ppm reduces the uptake of glyphosate. This may be alleviated by adding 2kg of crystalline ammonium sulphate for every 100L of water. A water conditioner such as Calgon® can sometimes be used to alleviate the effects of hard water. It is used to improve the compatibility between fluroxypyr (e.g. Starane®) and atrazine. High levels of bicarbonate can antagonise the ‘dim’ herbicides. Using maximum recommended rates of herbicide will overcome some of the problems, except for 2,4-D. Contains high levels of sodium chloride and tastes salty. These ions interfere with chemicals through inactivation, breakdown or precipitation. Very saline water is resistant to pH changes. To reduce the effects of salty water, dilute with fresh water. Organic matter, such as leaves and algae, can block nozzles, lines and filters. Algae can also react with some chemicals and reduce their efficacy. Remove organic material by filtration or treatment before adding to the tank. Table 2 Water quality affecting herbicides. See explanation of terms at the bottom of Table 3. Table 3 Water quality affecting insecticides. See explanation of terms at the bottom of Table 3. OK = Pesticide normally tolerates this quality of water. OK? = Reduced pesticide effectiveness may be experienced, especially if left in the spray vat for more than an hour or two. No = Reduced pesticide effectiveness is expected. Better = The pesticide may perform better with this water quality. (1) = If mixing with atrazine, do not use hard water. Test = Do a jar test to determine if any reaction occurs; various brands and formulations may react differently. Acidity or alkalinity affects the rate of hydrolysis or breakdown of chemicals in water. The pH scale is a measure of the acidity or alkalinity of water, and is based around a pH of 7 being neutral, pH of greater than 7 being alkaline, and pH of less than 7 being acid. In technical terms, pH = –log10[H+] or the negative log of the hydrogen ion concentration in water. temperature – the rate of hydrolysis increases as temperature increases. Organophosphate, carbonate and pyrethroid insecticides are often more prone to alkaline hydrolysis than other insecticides, herbicides or fungicides. Some insecticides (carbofuran, dimethoate, methyl parathion, monocrotophos, phorate, trichlorfon) and glyphosate herbicide provide better control in acid water of pH 4–6. Copper, lime and lime sulphur sprays should be applied in alkaline water to reduce crop damage. Bacillus thuringiensis (Bt) are also sensitive to alkaline water, but good formulations contain a buffering agent. Some pesticides have a very short half-life; the time it takes for half of the chemical to be degraded. 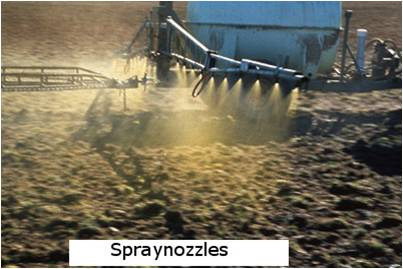 Spray as soon as possible after mixing, and clean out as soon as possible after spraying.